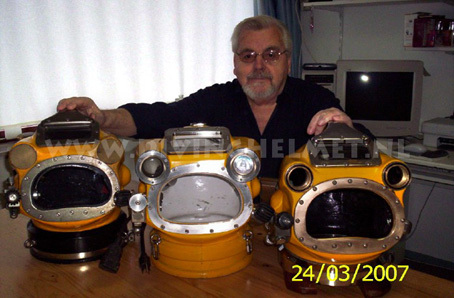 Back in 1982, Jan van Leest was working on the production platform NAM K15-FA-1 as a dive supervisor and was in charge of a team of seven divers. 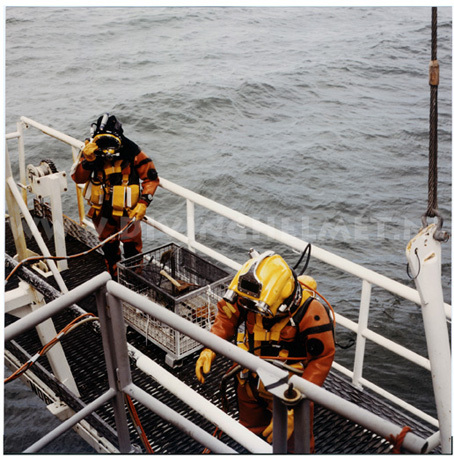 Their task was to remove marine growth from underwater structures of the platform and this required rotational brushes and specialist tools to carry out the job. To find the special brushes he contacted several suppliers including ‘Pommec’ in Hoogerheide. 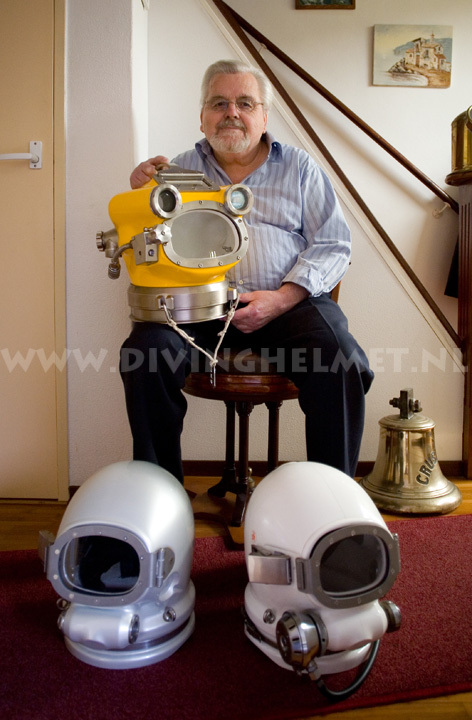 Pommec could not supply the brushes and tools, but Jan van Leest and his former dive buddy, ‘Piet Pomme’ of Pommec, did discuss the possibilities of manufacturing diving helmets. 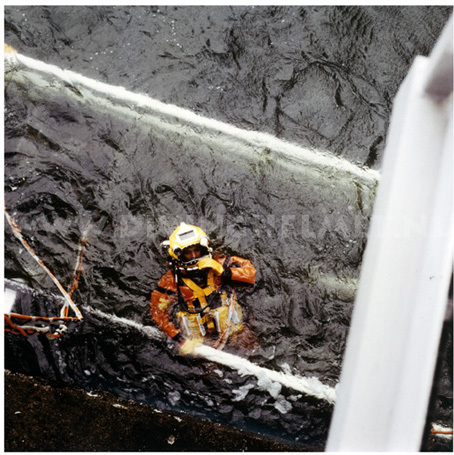 Unfortunately, Jan van Leest suffered a heart attack in 1983 while working at sea and was forced to quit his diving activities. With time on his hands, he turned his attention over the next two years to designing and building his first ‘free flow’ diving helmet. Pommec ordered five of his helmet shells which they then finished to their own specifications and then sold them to ‘Smit Tak Internationale’ of Rotterdam (see chapter: ‘1984 Pommec helmet’). 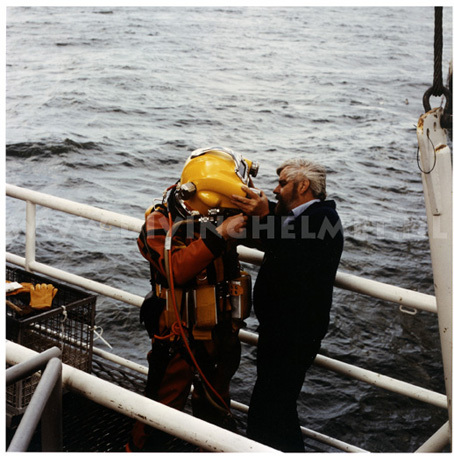 Jan van Leest went on to build helmets for diving companies including ‘Vriens’ of Bergen, ‘Noordhoek’ of Zierikzee and op Zoom. All helmets shells built and supplied by Jan van Leest have his initials casted into the back of the helmet (see illustration below). In 1984 Jan van Leest and Pommec ended their business dealings and Pommec then ordered their helmet shells from another supplier. Shells from the new source were identical to those built by Jan van Leest, but they no longer had his initials cast into them (see chapter: ‘1984 Pommec helmet’). 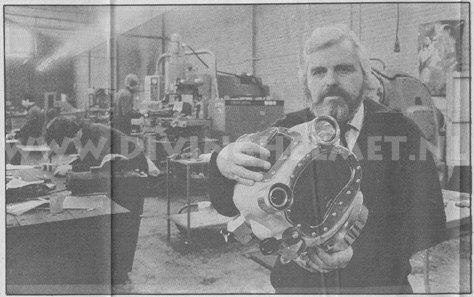 Jan van Leest continued his design work and produced an improved version of his ‘free-flow’ helmet. He was assisted by technician Tom Verborg, a specialist in all types of valves. He constructed the fail-safe inlet manifolds and relief devices, and also made all other required parts. His latest creation was the unique two-fold exhaust valve, ‘Z.Z.3’, with a body consisting of a single piece of ceramic cast, ‘316’ stainless steel. Another significant design improvement was the construction of a new version of the helmet in which both helmet and neck-ring formed one single unit. This combination proved to be a more comfortable and safe helmet to use. 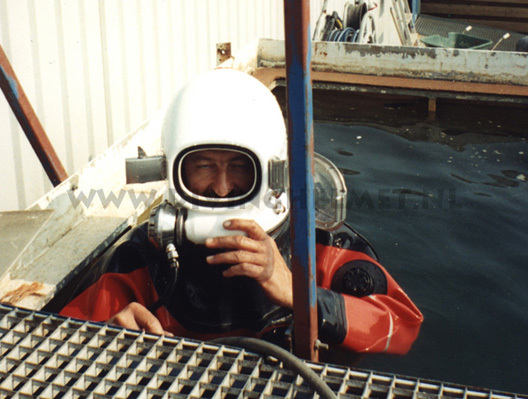 Test dives using the new helmet under extreme conditions (both inshore and offshore) were very successful. 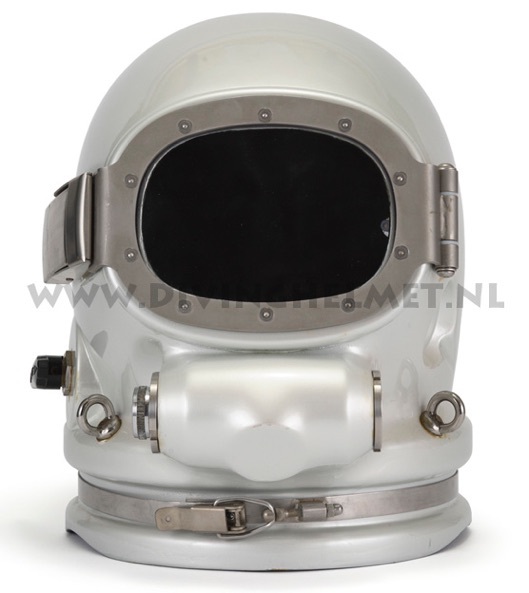 The helmet’s housings for lamps, cameras or acoustic equipment were made larger than on the previous helmet model and the diameter was increased from M42 to M60. Specially made glass was used for the windows which was pressure tested to 90 bars. Another exceptional model of this helmet used the Z.Z.3 exhaust-valve, an 8 pins Sea-con F8-F1 penetrator and a newly designed neck-ring assembly. However after engineering costs and cost benefit analysis were considered, it proved to be far too expensive for the diving market. Only one was ever made. Jan van Leest holding his ‘Improved’ Helmet in the ‘Brabants Nieuwsblad’, 8th February 1985. Photograph by Piet Hanssen of the ‘Brabants Nieuwsblad. 1995. 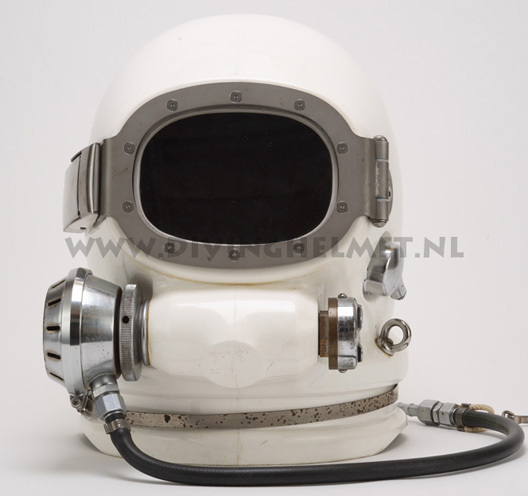 The Jan van Leest ‘Tip’ helmet. 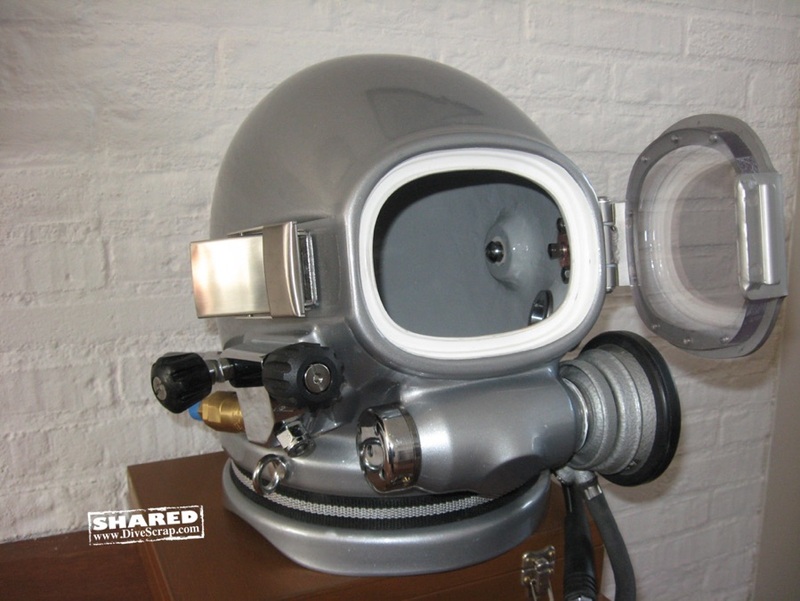 Jan van Leest had another radical design idea in which the diving helmet would replace the soft hood of a constant volume diving suit. These ‘cv-suits’ became very popular here in Holland and in northern Europe. Jan named the helmet after his daughter’s nickname ‘Tip’, thus the ‘Tip’ helmet. It is a dependable and comfortable unit with the neck-ring incorporated into the helmet which makes for quicker donning and removal. 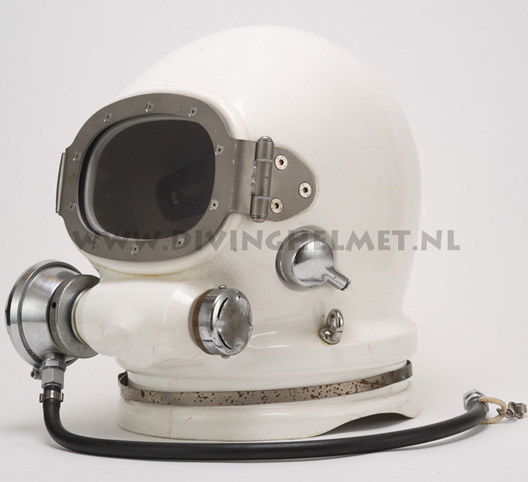 The hinged view-port is easy to operate and is useful in the ‘open position’ while the diver is waiting on the surface. Most single hose regulators can be inserted into the helmet’s front housing and a twin hose regulator or rebreather can be attached by means of an adapter. A one-way air-drain for undependable air supplies and a view-port de-misting device can also be installed. 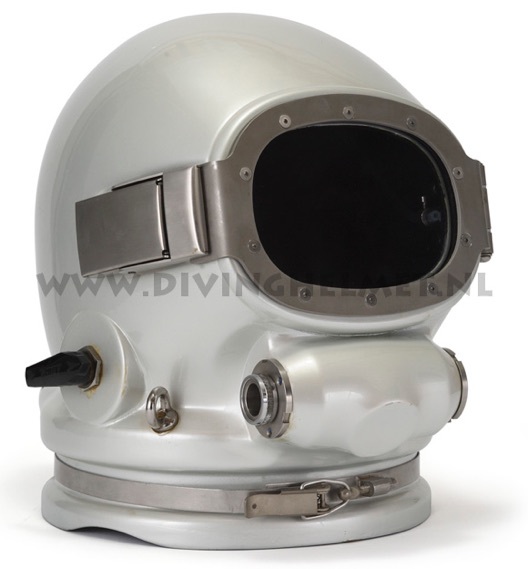 This is a real ‘heavy duty’ helmet that will stand up to harsh underwater treatment such as sandblasting at 800 bar. 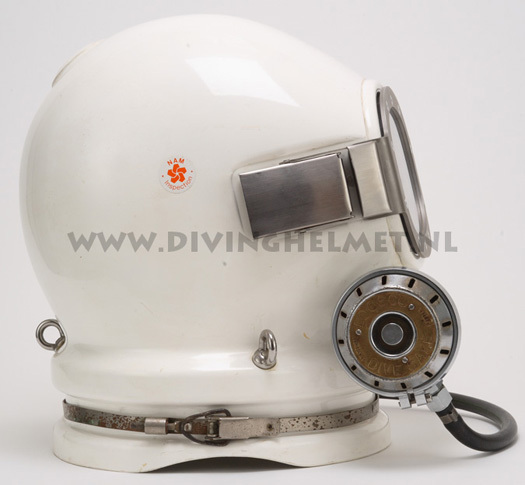 Above: a white ‘Tip’ helmet by Jan van Leest. The regulator is a dutch ‘Loosco’ demand regulator.